This process has stood the test of time, and more importantly, real world pressures. It has been used over the last twenty plus years to train management and employees to focus their day to day decisions on your business’ strategic objectives. 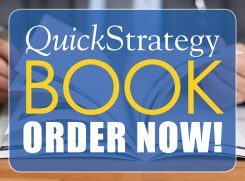 QuickStrategy is unmatched in both its ease of use and consistent ability to put operational and structural decisions in a strategic context. You will finally have a verifiable basis for allocating resources to strategic opportunities.